Every now and again, an artist comes along that blows you away, in every facet. 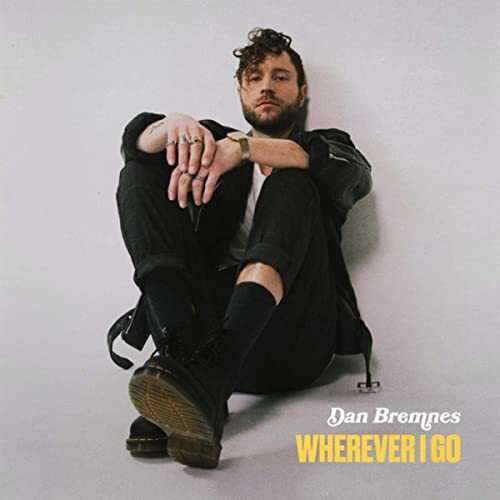 Songwriting, musicianship, energy, passion… and Canadian CCM singer/songwriter Dan Bremnes is one such artist. He released his label debut Where The Light Is in 2015, his Word Label Group debut Wherever I Go last year, and is now back with his second full length studio album Wherever I Go; comprising of the 7 tracks from the Wherever I Go EP last year, plus 7 brand new songs! 4 years between full length albums- there are seriously some high hopes that I have for this release. And…I think it’s safe to say that Wherever I Go has exceeded my expectations- which is definitely a good thing! So before I quickly break down the album, let me just say that if you want to know more about Dan, then I think a few years ago I wrote a pretty good intro to my review of Where The Light Is, and Jon wrote an extensive intro as well for his review of the Wherever I Go EP– so let me point you to those reviews here and here for you to read before you check out my thoughts on the entire project. But before we get down to the 45 minute impacting run time and how these 14 songs exquisitely show Dan at his best; let me just remind you all that Dan is one of the most passionate and dedicated artists out there at the moment, in my humble opinion! Because Jon has already reviewed the first 7 songs already- I’m not going to. I’ve read his review, I reckon it’s pretty good, and I completely agree with every sentiment Jon has written. Besides, it’d be a bit silly to rehash similar thoughts when you can make better use if your time by re-reading Jon’s review. But as we quickly jump into the back half of the album, let me just say that album highlights like the title track, “Up Again”, “How You Love Me” and “The Way”, to name a few, each showcase to me the heart Dan has for Jesus, and his passion to see the kingdom come here on Earth as it is in heaven. It’s not that these songs are better than every single track from Where The Light Is; it’s just that these melodies show a more mature Dan Bremnes– one that’s older and wiser; which makes these songs all the more relevant and applicable to today’s society and culture. In fact that’s the same with the last 7 songs on Wherever I Go– obviously written at a later period in his life, Dan’s emotion is clearly on display here, and the back end of the project reminds us all that wherever Dan goes after touring for this album- he’s going with God. It may be into the unknown but because God is there, it’s going to be a beautiful journey. “…The last few years have been a rollercoaster in my music career. There has been some unexpected disappointments and heartbreak. I wrote this song to say ‘I’m not giving up’ and I hope it can be your song too!! Whatever has happened, it’s not the end of your story, it’s just a bad chapter and there’s more to come…” From the above quote it seems that Dan has been through some heavy stuff personally and professionally throughout the past few years. But in “Thunder”, the eighth track on the album, he lays it all out bare and shows us his grit and determination, in an anthem that can be for everyone to declare and proclaim. Boldly asserting with true conviction that ‘…I’m rising up…no I never back down…’, across frenetic and explosive guitars, this 2 and a half minute rock tune is deserving of multiple listens, as we take stock and realise that setbacks can be conquered when God is on our side, and we get up, stare at them in the face, and declare that they won’t win. “Weakness” is another fun track with lyrics that are heavier and require multiple listens for us to fully grasp the concept- “Weakness” may be only 2 and a half minutes long, but what it lacks in minutes and seconds, makes up for in content. Dan is as emotional and hopeful in this track as any other I’ve heard of his, as we are met with a realisation that sometimes things in life can hold us down, such as fear or any type of weakness we’ve subconsciously allowed to have a hold over us. Yet Dan encourages us here, letting us know that if we rely on Jesus, then all of our adversity can and will be beaten. Maybe not in our timing, but it definitely will. And that’s a promise we can hold onto. Though not explicitly about Jesus, “Weakness” is probably one of the most inspirational melodies I’ve heard all year. Pop in nature, and maybe an official single in the near future. The EDM/pop track “Searching For Something” is the final ‘single’ which released from Dan prior to the album release date- and though this song is super catchy and gives me a Hillsong Young and Free vibe; I still reckon this is Dan going outside of his comfort zone. It’s enjoyable, but a bit weird for me to fully get into. Not that I’m complaining- this song is nonetheless poignant and heartfelt, as Dan reiterates that He is searching for something aka God (something we all should do in this life! ), reminding us all that no one can fill our hole in our hearts except for Jesus. “Let That Go” is probably one of the most CCM-esque song that Dan has ever recorded, as he encourages us all to let go of our burdens and the weights we’ve been holding and that have been weighing us down- as we give them all over to Jesus, while the acoustic guitar led Josh Wilson-esque “Thankful” has Dan recounting the reasons why he’s ‘…thankful, thankful to be alive, I am grateful, to know that You’re on my side, when fear’s knocking on my door, I know I’m gonna be alright, cause You are faithful and I’m thankful to be alive…’; and is a personal highlight- perhaps maybe this song could be the theme for this year’s Thanksgiving celebrations in the U.S. this year? Perhaps it’s wishful thinking, but that’s how catchy and how inspiring I reckon this song is! “Scars” is as poppy as ever, and contains musical elements from Danny Gokey’s “New Day” and thematical and lyrical elements from I AM THEY’s “Scars”, and sadly this song pales in comparison to its superior musical and lyrical relatives. However the album delivers a strong finish with the hopeful and emotional “Get There Soon”, as a husband sings to his wife, reminding her that if they keep on at their broken marriage, especially with God in the centre, that they will ‘get there soon’- to a place where they can be happy again. The song also doubles as a song about longing for heaven, and a reassurance that we’ll get there soon- and it’s this multilayered meanings as to why I reckon Dan’s album closer is one of the most inspiring songs of the year. “…the latest record, the inspiration behind it is basically living a life of faith, instead of fear. I think it’s really easy for us to sit at home and stay safe – it always seems like a good idea to take the safe route, but that’s not always what faith is about. I kind of bring it all back to Joshua 1:9 – “Be bold and courageous. Don’t be afraid, don’t be discouraged because God goes with you wherever you go.” Knowing that kind of truth, should be the kind of truth that gets us up off the couch. The kind of thing that makes us take the hard route, rather than the easy route – or as the Bible says, “the narrow road, rather than the wide one.”…” I don’t think it’ll ever be disclosed as to why Dan Bremnes split from Capitol Christian Music Group. However, it’s evident that he’s enjoying his time at Word- and Wherever I Go is proof of this. More than worth the 4 year wait (save for a couples of songs such as “Scars” and “Let That Go”), sky is the limit for Dan, and it almost makes this New Release Today April Fools joke real (maybe in the future…) So let us sit back and enjoy the poppy and inspiring new project! Is this album in your top albums of this year?